Busy, busy. That's what our schedule looks like this school year. I tried to make it more relaxed, really I did. We only have one activity per day, so far, and a whole day when we have no where to go. That's infinitely better than last year. Despite handbell choir practice and flute lessons adding to our busyness this week, I had high hopes for a smoothly scheduled week. On paper, it should have worked. I have determined, though, that there are no "normal" weeks and no way to predict schedule anomalies. We will always have an appointment for a doctor / orthodontist / dentist, a family commitment, an illness, a field trip, friend get-together, or a day when I just need to get out and shop. So, I've decided I'm going to become a go-with-the-flow-blow-in-the-wind type of person. Yep, or at least pretend I'm one of those people and that it doesn't drive me batty when we can't stick to the schedule. This week Amber had her GI doctor visit, so first thing Monday morning our normal week schedule was obliterated. The doctor put Amber on a second medication to counteract the mild side effects of the much needed medication that is working miracles for Amber's digestive problems. At least she didn't order more immediate tests. A happy, healthy looking child again! She even enjoys her pointe technique classes and isn't wiped out at the end. Since we were already out and about on Monday, we stopped by the Girl Scout shop and picked up Amber's Bronze Award pin and turned in our paperwork. Amber has now officially finished her Bronze award and Girl Scouts. Hooray! We will continue volunteering with Heartland Humane Society since we have enjoyed it so much. The cat blanket knitting (Amber) and crocheting (me) continues in the evenings while we relax and we are baking for an extra Labor Day weekend bake sale too. 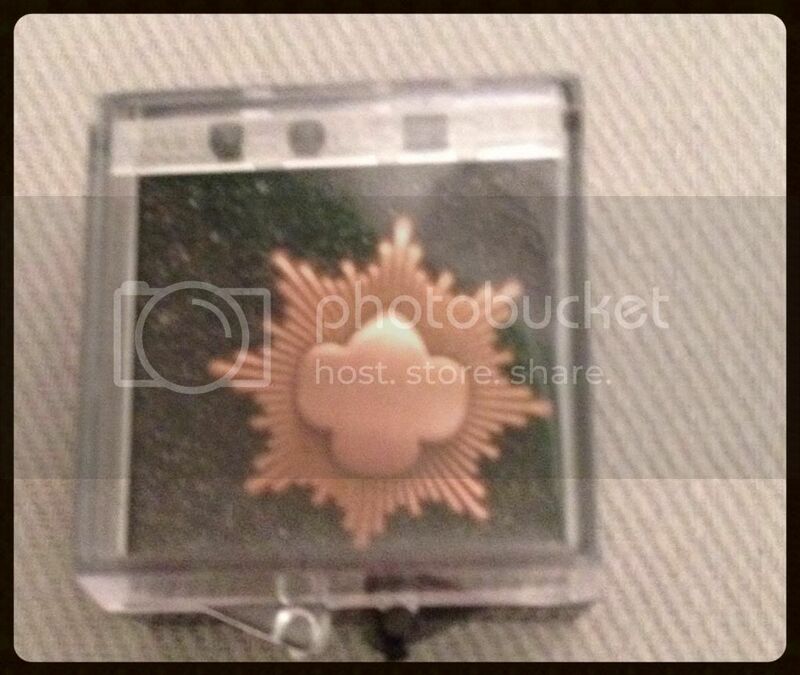 There it is, the Bronze Pin. We still haven't put it on her vest. In school this week, we finally began 6th grade spelling. It was supposed to start a couple of weeks ago, but we had days off during those weeks so I kept putting spelling off. Sheesh. It's not that hard to complete. I don't think I was as ready as I thought to start the full schedule of subjects and procrastinating on spelling was my way to hold something back. Amber also had her first math test of the year, but since there hasn't been any new material yet I didn't expect this test to be of any difficulty. She has been pretty much sailing through the assignments each day without even needing my help to go over the lesson portion. Eventually, we will get back to where I teach the new concept each day and she reads the lesson in the book as reinforcement. I'm not sure when that might happen because a good half of Saxon Algebra 1/2 looks to be a review of 7/6. However, for now she is reading the lesson herself then doing the exercises. 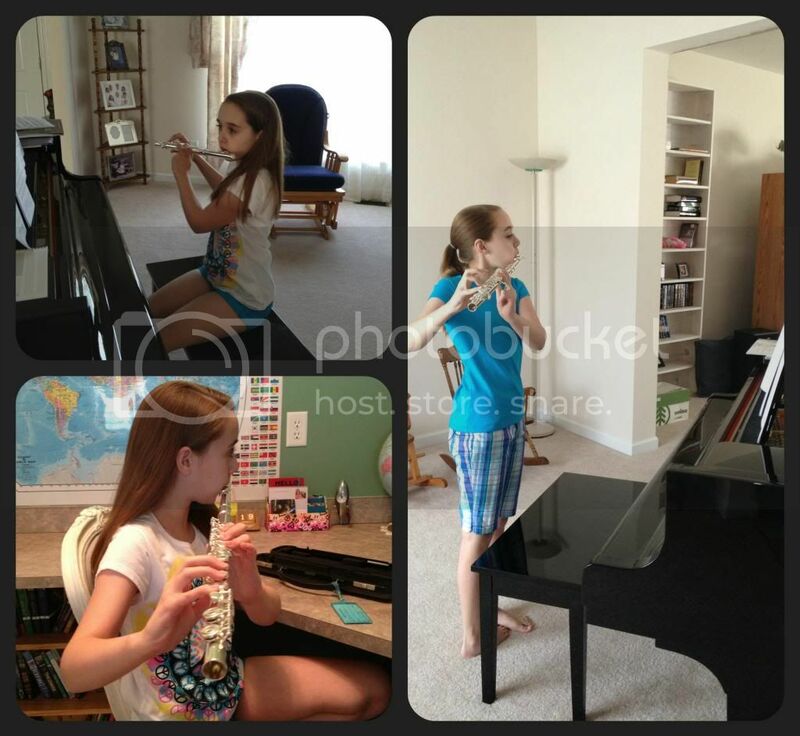 Amber also completed her first music appreciation lesson of the year directly after her first flute lesson. That wasn't such great timing on my part. Originally, the timeslot was for art appreciation, but we decided to alternate weeks between music and art appreciation. Oh well, Amber can simply be quite musical on those days. Firsts for the year: First Math test, first Spelling test (with kitty buddy in her lap) and first Music Appreciation project. While being terribly nervous right before the flute lesson, Amber came out all smiles and has been practicing ever since. Evidently, she did stellar for her first time playing a flute and she reads music excellently. I'd hope so after 5+ years of playing piano! Still, it only helps her self esteem to hear it from someone other than her mother. Fred was out of town for most of the week making our days seem a bit unending since he never came home to signal the definite end of school days. Thankfully, Amber has enough activities that we just sorta finished school in advance of activity time. We were pathetic for dinner and ate Outback curbside to-go, twice. Sigh. But their salads are good and gluten-free. We also watched an inordinate amount of Robin Hood in the evenings while working on kitten blankets. For some reason, Amber had been loathe to move on to season 2, so we were stuck between seasons for a couple of months. Finally, this week she decided it would be alright to try Robin Hood again. I do believe she has renewed her addiction as we've now finished season 2 and are half way through season 3. I won't spoil it for anyone, though it's not like you can't read it all online, but season 3 isn't nearly as good as the others. And seriously, did they have stock in hair gel or fail to let the actors bathe? Each season more and more characters have such greasy looking hair that it just makes my skin crawl. Even Amber noticed it, and I quote "eeww.. what happened to Gisborne's hair. It's nasty and the wrong kind of long." Poor Richard Armitage, poo-pooed by an 11 year old girl. But she's right, it's definitely not the best look. Flute, need I say more? Besides watching TV, we did get in some outside play time in the evenings. Unfortunately, our lovely cool summer has turned dry, hot and muggy, just like it always does in Missouri. Don't let the month fool you. Our summers go until October sometimes and I swear September must be one of our hottest months. Most of the week Amber slept later than I would like and I'm not sure if the scheduled school times need to be adjusted or if I need to find a way to get Amber up earlier. She so badly needs to get her reserves back after having been sick. One late night and she is sickly the whole next day. I think I'll leave the schedule for a couple more weeks to see if Amber can start working toward earlier mornings without feeling sick. If she could be ready for school by 9 am I'd consider it a done deal. This weekend we have nothing planned, so of course I'm preparing house projects. I just need us to complete two specific projects before I can start refinishing our dining room furniture. I've decided to go with black and distress the edges. Fred is very unsure of this, but as I keep most of the furniture covered with a table cloth or chair covers, it can't get much worse. Besides, it's cheaper than buying a whole new set. I just love her learning space! Huzzah to her Bronze pin. I used to be in scouts and LOVED Every minute of it! Glad she is feeling better! Enjoy your week and your Labor Day! 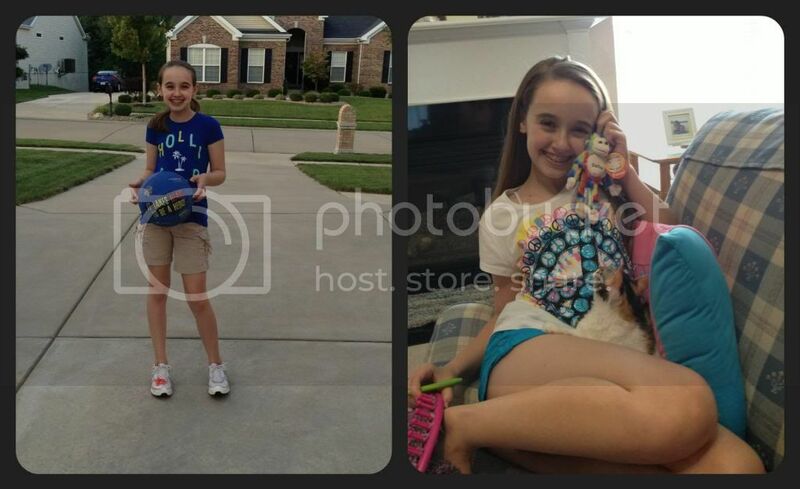 You're a great mom... your love for Amber just shines through as you write about your week. 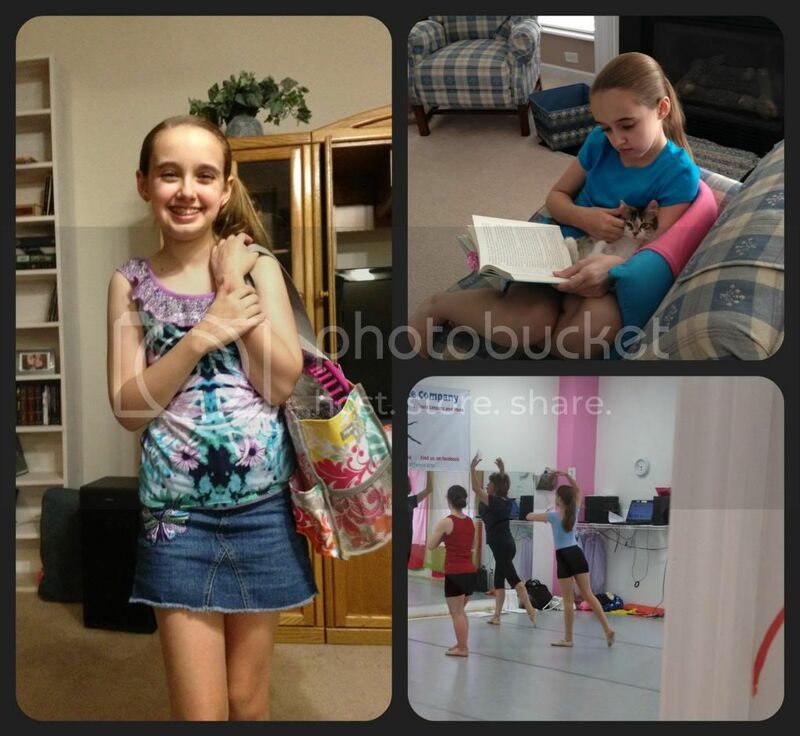 Your homeschool is structured just perfectly for HER specific needs, and I admire that! I have fond memories of being a Brownie and a Girl Scout - congrats on the Bronze award! Glad she is on the mend. Oh what a great week! We just finished up our 30th day of school this past Friday and I can't believe it. Amber definitely does look happy, healthy, and busy! It's so good to see! I love the pic of her with the kitten curled up on her lap. Our cat loves to sit on all our school books and papers while we learn! I watched Merlin on the SyFy channel as it came out. Amber just started Merlin yesterday on Netflix since we finished Robin Hood (boo hoo). I'm re watching it with Amber, but so far we are only 3 episodes in. I wasn't sure about the Merlin ending. I was mostly sad it was over. oh neat a bronze award - when I was scouting (a million years ago) they didn't have the bronze award and I quit before getting my silver award. Always to be reminded by my sister she was the only one in our town to get the gold award! ha!! Looks like a happy week! Good for you, and Amber!, keeping at things even when it doesn't all go according to schedule. That's one thing homeschooling has taught me, stay flexible and go with whatever comes at you. Hope you are having a fantastic week this week.